The week of October 15-21 is National Teen Driver Safety Week. What does this mean to you and why is it important? Teen drivers are considered a high-risk group of drivers because of their inexperience behind the wheel and tendency to make rash decisions. This week was set up as an outreach to teen drivers in ways that help raise awareness about certain issues. States have their own campaigns that promote the different areas of distracted driving, the importance of seat belts, and not driving impaired. Distracted driving comes in many forms, including eating, applying make-up, or picking things up off the floor of a moving car. The importance of always paying attention to the road while operating a vehicle is vital to keeping drivers safe and from causing harm to others. Two areas of emphasis for many states are the distractions of cell phones and friends in the car. One of the biggest distractions to drivers of every age are cellphones. This is highlighted during teen driver safety week to prevent habits from sticking. Since the brain is not fully developed in rational decision making when most teens get their license, it is important to emphasize the point multiple times that looking at a cellphone screen for just five seconds endangers the teen driver, surrounding drivers, and pedestrians. The U.S. Department of Transportation has distributed a study on the effect of passengers in the vehicle with teen drivers. It’s no surprise that a group of friends in the car is going to distract the driver because of volume and horseplay. When multiple teenaged peers are in the car, horseplay was 9 times more likely and loud conversation increased 26% of the time, as compared to when an adult or parent was present. With more rowdiness and disorder happening in the car, it’s easy to see how the driver can’t focus as well on operating the vehicle. Other teens were more likely to engage in risky behavior and ignore traffic laws with friends present. Buckling up has been a national campaign to spread the message that it can make the difference between life and death in a car accident. Plenty of movies have been made that show consequences of no seatbelts and pledges are available for signing. Parents can also make an effort to emphasize the need to put on a seatbelt before starting the vehicle. Some vendors are using this week to emphasize the dangers of impaired driving. Whether it’s alcohol, drugs, or prescription medication, it is important that teens know to not drive under the influence of these items. Using the drunk goggles or a driving simulator with delayed reactions in place, organizations are showing teens what it feels like to be impaired behind the wheel when they can think straight. Hopefully, these demonstrations continue to spread awareness and prevent tragedies in the future. 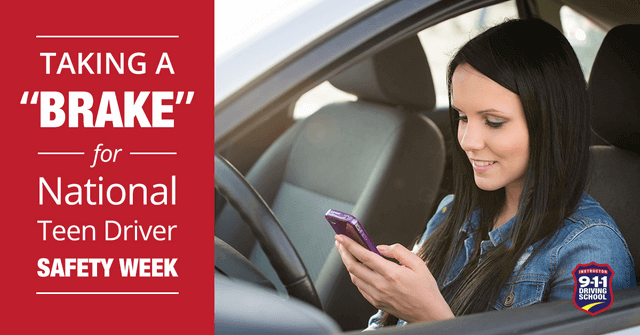 If you want to get involved in National Teen Driver Safety Week, talk to your local city council, driver’s education program, or state’s Department of Transportation to see what events they have going on. Training the youngest drivers to be responsible is putting them on a path of safety for the rest of their lives.